removing the hands & dial from the movement. The technician then completely disassembles the movement, one screw at a time, gear by gear. parts need replacing, refinishing or repair. specially designed, individual baskets. They are then ready for the cleaning process. 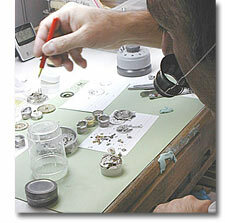 Universal's Technicians perform the cleaning process using the most modern horological cleaning equipment. During the cleaning process, the separate components of the watch movement are ultrasonically cleaned in specially formulated watch cleaning and rinsing solutions. 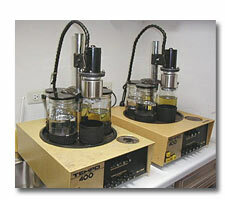 These solutions remove any particles or contaminants and emulsify dry oil and congealed lubricants.